This training plan is one of the 130+ Plans included with an Athlete’s Subscription. CLICK HERE for more info. One of our most popular articles over the years has been ‘Rob’s Top 5 Exercises for Military Athletes’. We’ve decided to utilize only these exercises in this 5-week training program. Each exercise trains the fundamental aspects of military fitness attributes – strength, work capacity, endurance, and chassis integrity. 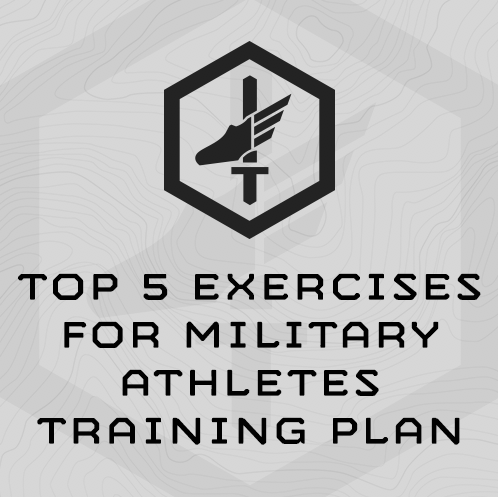 This training plan is straight forward, no-brainer solution for Military Athletes looking to improve their overall fitness. It includes an initial assessment in Week 1, and percentage based progressions in the following weeks to immediately scale to the athlete’s fitness levels. Week 5 is a reassessment to record your improved scores. Sandbag Get Ups – the best overall exercise to train a military athlete’s “Combat Chassis” – leg, core, and lungs. With each rep, the athlete works core flexion, rotation, and extension. He or she also must do a loaded lunge or squat to stand up, and finally, at high reps, his heart and lungs will be burning through the work capacity hit. Craig Special – 1x Craig Special is a Hang Squat Clean + Front Squat and is my favorite total body exercise. Technique issues can quickly crop up with Olympic movements, and I’ve found the hang squat clean to be the easiest for athletes to master. The clean trains explosive power, and catching the heavy barbell in the squat helps train the athlete to take impact – a valuable attribute for a military athlete. Finally, with each rep, the athlete gets in 2x front squats – my favorite squatting movement. Three Mile Ruck Run for Time @ 45# ruck, plus 10# sledge, hammer, dumbbell or rubber rifle – Rucking is a huge fitness demand for military athletes and the best way to improve rucking is to ruck. The mid-distance 3-mile ruck run is long enough for fitness to transfer to longer efforts, but short enough that the athlete can ruck run the entire distance and train overall rucking speed. Finally, ruck running with this load further trains the “Combat Chassis” – legs, core and lungs. Push Press – While the old meathead in me lusts over the Bench Press, the Push Press is the top upper body pressing exercise for military athletes because of its total body element and simple, mission-direct transferability. Strength Coach Pat O’Shea called the Push Press the “King” of upper body exercises. A vertical pressing movement to balance the vertical pull in the Rope Climb, the Push Press is really a total body exercise with an upper body finisher. Everything gets worked – legs, core, chest, and shoulders. Even better, this exercise can be completed with just about anything heavy – sandbags, dumbbells, kettlebells, big rock, barbell, girlfriend…. The strength work will be based on your 1 Rep Max (1RM), conducted in the first training session. The following strength sessions in the training plan use a percentage based, linear progression to immediately scale to your strength numbers. So, if your SESSION 1 1RM was 185#, find 80% of that load by multiplying your 1RM by 80% (185 x .80 = 148. Round up to 150.) 150# is your working weight. Use the first three rounds to work up to 2x 150#. Rounds 4-8 should be conducted at the working weight, or in this example, 150#. The strength circuits each include a stretch or durability exercise. Consider the stretch or mobility exercise your rest between rounds. There is no more rest between circuits more than what is required to change equipment and load barbells. Understand the strength circuits are not mini CrossFit-like WODs. Work briskly, not frantically. Craig Special- After the warm up, load up the barbell with a weight you can lift 3x. Then add weight, and complete 2x reps. Then add weight and start doing singles, adding weight rapidly until you reach your 1 Rep Max (1RM). Record your 1RM. Push Press – After the warm up, load up the barbell with a weight you can lift 5x. Then add weight, and complete 3x reps. Then add weight and start doing singles, adding weight rapidly until you reach your 1 Rep Max (1RM). Record your 1RM. Use Common Sense working up to your 1RM – Be smart and safe while working up to your 1RM. Don’t risk injury. Be smart and safe. And don’t linger – you need to complete each session in 45-60 minutes. This training plan deploys a 3-mile ruck run assessment and uses assessment performance for the follow-on progressions. In this way, the plan automatically “scales” to the incoming rucking fitness and speed of each individual athlete. Once you have completed the 3-mile ruck run assessment, you will utilize the MTI Ruck Calculator to find your interval pace for follow on sessions. CLICK HERE for the MTI Ruck Calculator. Set the assessment distance to 3-miles, and input your final time. The calculator will then provide you with your ‘per mile’ interval time. This is your goal time for each interval. Complete the mile ruck run, rest for 8 minutes, then complete the second ruck run interval. If you completed 50x Sandbag Get Ups during the SESSION 1 Asessment, you will do 5x Sandbag Get Ups (50 x .10 = 5), then rest 30 seconds. Repeat for 10 rounds total.